Patriot Bonds were first released in 2001 and their issuance continues to confuse numerous investors all these years later. What's the difference between Patriot Bonds and Series EE savings bonds? Are these different or unique products? Given the way that Patriot Bonds came onto the scene, the misunderstanding is quite reasonable. Patriot Bonds are absolutely identical in every way to the paper versions of the Series EE Savings Bonds, and this is one of the primary reasons there's so much confusion. They are, in fact, the same thing. The only difference is that if you bought your Series EE savings bond through a local bank or a financial institution after December 10, 2001, the words "Patriot Bond" might have been printed on the face of the certificate. That's it. Really. All the same terms and conditions apply to both. The United States Treasury told investors at the time that Patriot Bonds were released that they were a way for them to express support for the country's anti-terrorism efforts. The memory of the deaths, violence, and bloodshed just a few months before on ​September 11 was still fresh in the minds of a population. People were reeling from the sudden shattering of domestic tranquility on such a grand scale. The U.S. Treasury explained that the proceeds of Patriot Bonds would be deposited into the federal government's General Fund and that they would be spent according to the law—which, at the time, included funding the ramp-up in anti-terrorism programs. The Treasury also went on to explain that only Patriot Bonds purchased through certain financial institutions such as local banks were eligible for the inscription. Other Series EE bonds, such as those bought through a Payroll Savings Plan when employers withheld funds from employees' paychecks at their request to put the money into savings bonds, were processed differently. They were purchased through multiple vendors and organizations that didn't have access to the requisite printing equipment. The only reason these bonds could not be Patriot Bonds was that the words couldn't be printed on them. Patriot Bonds were issued for just 10 years, from December 2001 through December 2011. It required additional money to print these bonds and this didn't turn out to be entirely cost-effective for the government. So there you have it. 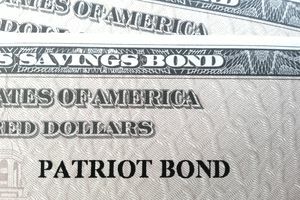 If you purchased a Patriot Bond before December 2011, its "differences" from Series EE Bonds are not an issue. And if you do have such a bond on hand, one you invested in multiple years ago or that was given to you, rest assured that it will continue to mature and accrue interest until 2042. That door did not close when the bonds were no longer printed. You can convert your Patriot Bonds to electronic bonds through the Smart Exchange program available at TreasuryDirect, or just hold on to them for 30 years. Keep in mind that Patriot Bonds purchased before May 1, 2005, paid a variable interest rate that was subject to change every six months. Those that were purchased after that date pay a fixed rate.